We are excited that you are considering admission to SUNY Korea. The curriculum at SUNY Korea consists of selected degree programs of Stony Brook University. The design and delivery of such programs agrees with the degree programs as delivered at Stony Brook University. The degree granted will be from Stony Brook University. For Spring 2012, SUNY Korea offers selected M.S. and Ph.D. degrees of Stony Brook's College of Engineering and Applied Sciences. These programs have selective admission and are renowned in the United States. Qualified applications to the SUNY Korea programs will be selected according to the standards and requirements of Stony Brook University. Choosing a university is one of the most important decisions you'll make. 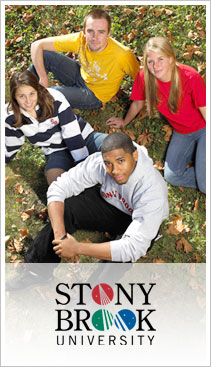 By choosing SUNY Korea, you are joining Stony Brook, a university with an enrollment of more than 24,700 students. Stony Brook University is considered a flagship campus of the 64 campuses in the public university system comprising the State University of New York (SUNY). SUNY is the largest public system in the U.S., with more than 450,000 students from 160 nations, 30,000 faculty members, and over 2.5 million alumni residing in New York State and throughout the world. B.S. in Computer Science: Please visit SUNY Korea Undergraduate Admissions website for more information on "How to Apply". M.S. & Ph.D. in Computer Science: Please visit SUNY Korea Graduate School Admissions website for more information on "How to Apply".